As the nation reckons with the aftermath of the Kavanaugh hearings, state courts and state constitutions likely will play an increasingly important role in defending civil and human rights. While the United States Supreme Court has already started its march further rightward with decisions such as allowing North Dakota’s voter suppression law to apply to the midterm elections, it is not inevitable that state courts fall prey to the same trend. However, through actions designed to lock-in conservative supreme court majorities in states like Arizona, West Virginia, North Carolina, Pennsylvania, and Florida, the Right has shown it has a head start in recognizing the importance of state courts. Progressives must catch up in a way that breaks down, not replicates, the will-to-power politics employed by these actors. This could mean reform of judicial selection processes, but, more importantly, it means engagement with those processes in the first place. When interpreting their own constitutions, state courts can chart their own path on doctrines that conservatives have used to inappropriately restrict individual rights under the federal Constitution. The first type is undoubtedly important, and one to which most of the post-Kavanaugh confirmation attention has been given. But robust engagement in state constitutional law calls for more. It is critical that the progressive legal community broadens its horizons for what a state court engagement strategy can accomplish. For example, the Washington State Supreme Court recently culminated its years-long review under its constitutional education provision that resulted in an influx of money into the state’s underfunded schools. The Pennsylvania Supreme Court’s decisions finding justiciability—legal enforceability—to its constitutional provisions on education and environmental rights are of similar importance to its decision overturning the legislature’s partisan gerrymandering. The second type of decision is predicated on the third, which shows how state courts can shape general constitutional doctrines such as separation of powers, political question, and self-execution to fit their constitutional context appropriately. In advancing a substantive view of these constitutional provisions, these doctrines were required to change to better reflect the structural differences between states and the federal government. This, in turn, bolsters corollary constitutional provisions: the Pennsylvania Supreme Court’s decision to overturn partisan gerrymandering was justified on political question grounds through its decision finding its constitutional education provision justiciable. Thus, all three types of decisions are interconnected in advancing a rights-protective jurisprudence. Unfortunately, such discussion is frequently left out of general discourse of constitutions and constitutional law. Robust engagement with state constitutions requires not only more advocates to bring claims under state constitutional law or scholars writing about state constitutional issues, but more community education about state constitutions and their place in our legal system—and where those constitutions can be taken. 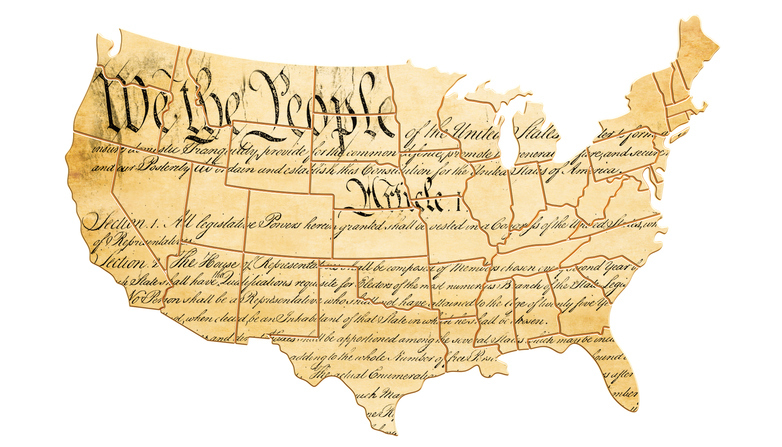 The knowledge that the state constitutions are more easily amendable than the federal constitution can also be put to good use: adding provisions to state constitutions providing increased civil rights protections, or a right to shelter, healthcare, public benefits, or the environment is more easily achieved than if such an effort was to be undertaken at the national level. A better understanding of the potential of state constitutions to protect individual rights must be accompanied by a warning: state constitutions can just as easily be used to restrict those rights, the Colorado anti-LGBT amendment at issue in Romer or anti-affirmative action provisions being immediate and well-known examples. The use of federal power was vital to correct the tyranny of states against Black Americans, and many state constitutions still contain the legacies of Jim Crow. While the federal constitution should serve as a floor from which state constitutions can be more protective, if the United States Supreme Court inverts those floors into ceilings—for example, by expanding its religious liberty doctrines to swallow rights such as nondiscrimination and abortion, the power of state courts to interpret their constitutions to be more protective is inhibited. Because the necessity of federal power and the ability of the U.S. Supreme Court to limit the ability of state supreme court to be more rights-protective, state constitutional engagement is not an “either/or” strategy, it is a “yes, and.” Rather than sacrificing one for the other, it requires advancing rights-protective theories on both fronts. Certainly, it is easier to keep track of nine justices in D.C. than the hundreds outside of it. But to sever from any real consideration these jurists’ views of the law is to malnourish the American constitutional milieu. Working for a state court judiciary that advances a constitutional narrative more protective of individual rights, amending those constitutions to provide greater textual evidence for that development when necessary, and elevating these narratives to spur recognition in other jurisdictions and American constitutional thought as a whole are fundamental parts of any strategy to mitigate the near-certain erosion of federal protection. Through this, too, we may be able to emerge with stronger rights jurisprudence than before. Considering what we are beginning to see from the U. S. Supreme Court, we only lose if we continue to wait.